This is the big one - the tallest mountain in the Northeast! Mt. Washington towers over its neighbors at an elevation of 6,288ft. It is known for erratic weather and extremely strong winds. A winter climb of Mt. Washington is a serious undertaking. Participants can expect an 8-10 hour climb up the Winter Lion Head Trail or one of the many other routes that lead to the summit - with a large portion of the day above tree line. Participants should be prepared, in good physical shape with prior hiking experience. To be prepared you will need the following items. 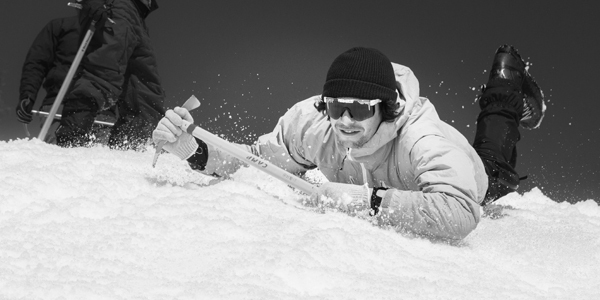 When selecting clothing for your adventure, think layers. Choose synthetic materials, wool, or fleece. The saying is "Cotton Kills." It will absorb sweat and then freeze - increasing the chances of hypothermia. It is important to continuously take in calories throughout the day. Every break you should eat a snack during the short 10 to 15 minute rest. Food is the wood to your fire and to keep it stoked it needs constant replenishing. Do not plan on cooking or preparing your snacks in the field. All food should be prepared and packed ready for immediate consumption. We suggest crackers, pizza, candy bars, jerky, chips, cookies, trail mix, fruits, Gu, energy bars, and hard candies. Add peanut butter, cream cheese, hard cheese, or pepperoni for additional calories and taste. If you enjoy bread items, bagels work well. Include some salty snacks to replenish lost salts. To help prevent cramping and heat related injuries, you will need at least 2 liters of water per day. Water is preferred, but other liquids such as gatorade help replace electrolytes and work well, too! Hydration bladders do not work as they freeze during the winter months. Please leave these at home. Instead, bring 32oz. Wide Mouth Nalgene bottles and insulating parkas if you have them. If not, you can use a sock to insulate each water bottle. You do not need prior experience to join us! The Mount Washington Climb is designed for all ages and experience levels. 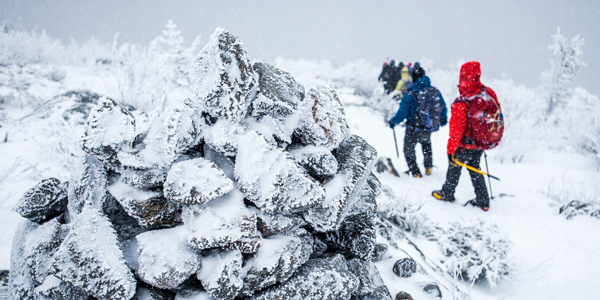 The weather above treeline can be extreme and participants should be prepared for exposure to high winds and arctic temperatures. We will work hard to ensure your safety, teach you the necessary skills and keep the excitement level high! Most of the required equipment is available for rent from our affiliate mtnGEAR. NEM climbers will receive an exclusive discount of 20% discount on all rental equipment and clothing. These are boots that are designed specifically for snow and very cold weather. They are often composed of an internal insulating boot and an exterior plastic or leather boot. Hiking boots and winter snow boots are not suitable for Mt. Washington or the high peaks of New England in the winter. Where should I stay during the course? We recommend The Bunkhouse at Northeast Mountaineering. For your convenience, we offer co-ed, hostel-style accommodations on site. The cost is $20 per person. To maximize your climbing experience, we recommend that you stay in the area the night before your climb. Looking for less crowds? Check out the NH 4,000 footers to get off the beaten path. Still not sure? Contact Us for a recommendation. Mount Washington can be intimidating - especially in winter. Add a day of preparation to your summit climb. Upon completion of our Mountaineering Skills Course - jammed packed with excellent skills and information - you will feel confident and ready to take on the northeast’s highest peak.